Peter Fragiskatos, right, Liberal MP for London North Centre, made the funding announcement after a tour of the Woodstock facility. An Ontario auto supplier won $12.73 million from the federal government to help make lightweight steel parts designed to boost fuel efficiency. 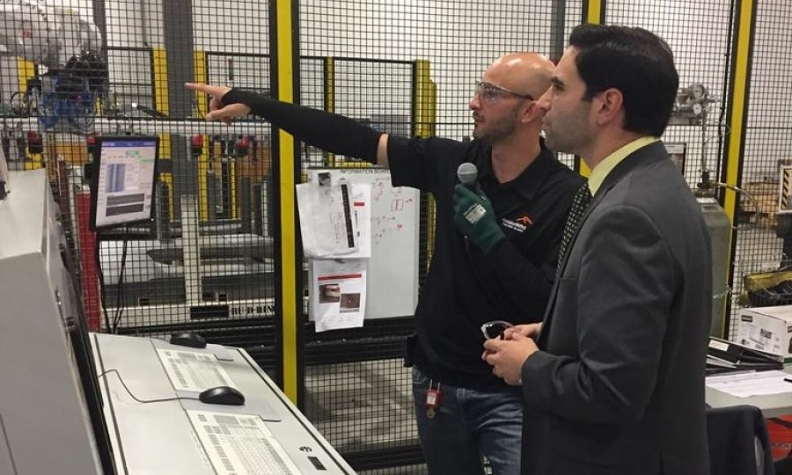 ArcelorMittal Tailored Blanks Americas Ltd. will apply the funding to final payments for recently installed robotic laser-welding equipment at its 93,000-square-foot (27,400-square-metre) plant in Woodstock. “That results in lighter-weight steel and ultimately contributes to improved vehicle fuel efficiency … and reduced carbon emissions,” the company said in a statement. ArcelorMittal makes parts for the Chrysler Pacifica, which is assembled at Fiat Chrysler’s Windsor assembly plant, where a new plug-in hybrid version goes into production later this year. Peter Fragiskatos, Liberal MP for London North Centre, made the funding announcement after a tour of the Woodstock facility. The investment retains 45 existing jobs. Fragiskatos said the investment is helping "the global competitiveness of our auto part manufacturers." The money comes from Canada’s Advanced Manufacturing Fund, which offers repayable contributions worth up to half the total eligible costs of projects worth between $10 million and $20 million. ArcelorMittal Tailored Blanks Americas is owned by ArcelorMittal Canada Inc. in Hamilton. Parent ArcelorMittal of Luxembourg is a global steel and mining company with operations in more than 60 countries.